Cobblers boss Chris Wilder believes skipper Marc Richards would have got close to scoring 30 goals this season had inury not curtailed his campaign. Richards underwent an operation on his troublesome Achilles on Monday, and ends the campaign with 18 goals which means he is still comfortably the club’s top scorer. What proved to be the 33-year-old’s final goal of the season was the crucial penalty in the 1-0 win at Oxford United on February 16. 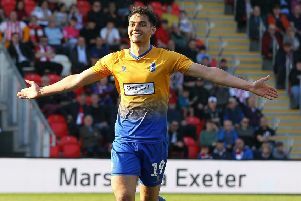 He missed the following seven weeks to rest the injury after that match at the Kassam, and returned to action last month, but it was to prove a failed comeback as, after two starts, it was decided he wasn’t right and should go under the knife to ensure Richards is fit and firing for the start of pre-season. “The injury is disappointing for Rico because he has been a fantastic part of this group,” said Wilder. The loss of Richards saw Wilder bring John Marquis in on loan from Millwall, while he had already signed James Collins, also on loan. Between them, the pair have done a great job in covering the loss of the club captain, with Collins scoring seven times in 17 appearances, and Marquis five in 10. Ricky Holmes has also stepped to the scoring plate, as has John-Joe O’Toole, and Wilder is delighted with how his squad has coped. “To take a player of his ability and character out of the team at a really important stage of the season was a big blow,” said the Cobblers boss. “But all credit to the lads that carried on after he was injured to keep things going, and to keep the unbeaten run going and keep picking up the points. “We have undoubtedly missed Marc, and I think any team in any division would miss their club captain, their leading scorer.